The powerful software that keeps top advertisers innovating and holds social media organizations to account for their content. 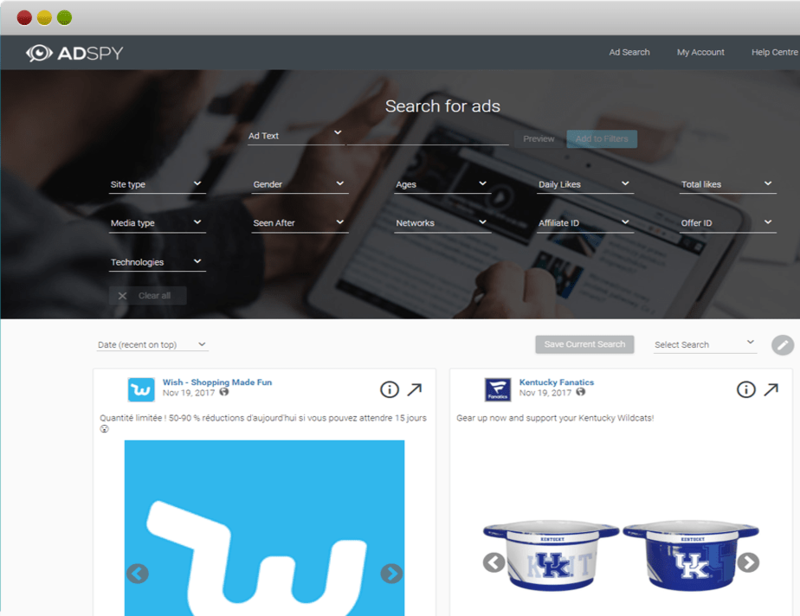 AdSpy is the largest searchable database of Facebook and Instagram ads in the world. Using our unparalleled array of data and innovative search functionality, uncovering the ads that you need to see becomes a simple task. Comprehensive data from social media sites puts you in control of the fastest developing advertising platforms on the internet. Global coverage lets you assess the world’s trends without compromise. 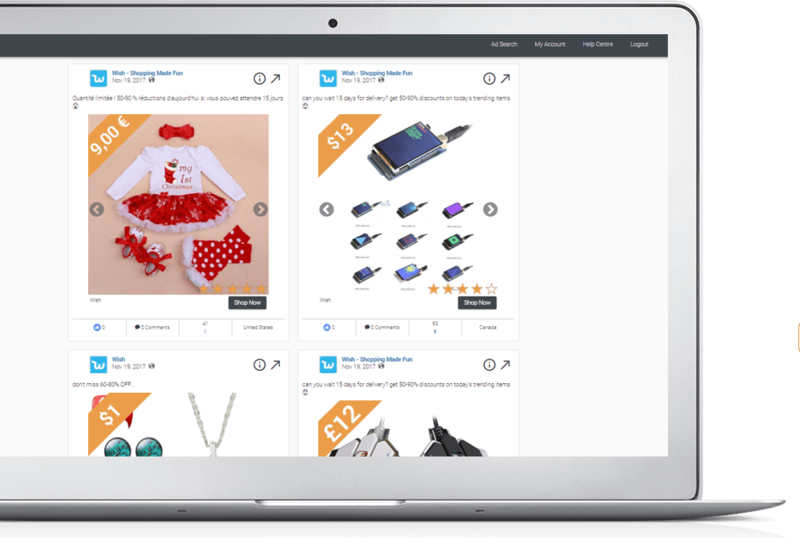 Exhaustive search and filter features will uncover the ads that you and your company need to know about, and the simple interface will help you discover them with ease. AdSpy offers the most search options of any Ad Intelligence Tool, so you can find the data you want, how you want. Search in the usual way: ad text, URL, page name. Search true data from user reactions in advert comments. Be as rigorous as you need to: search or filter by affiliate network, affiliate ID, Offer ID, landing page technologies - whatever helps you find the information you can work with. Leave no stone unturned: our ever expanding collection of ads gives your campaign the greatest foundation for success. AdSpy is based upon one of the most substantial databases of ads you can find: 68.8 million+ ads, 88 different languages, across 196 countries. Controlling the quick, intelligent interface, you’ll glide through vast amounts of data until you have exactly what your campaign needs. 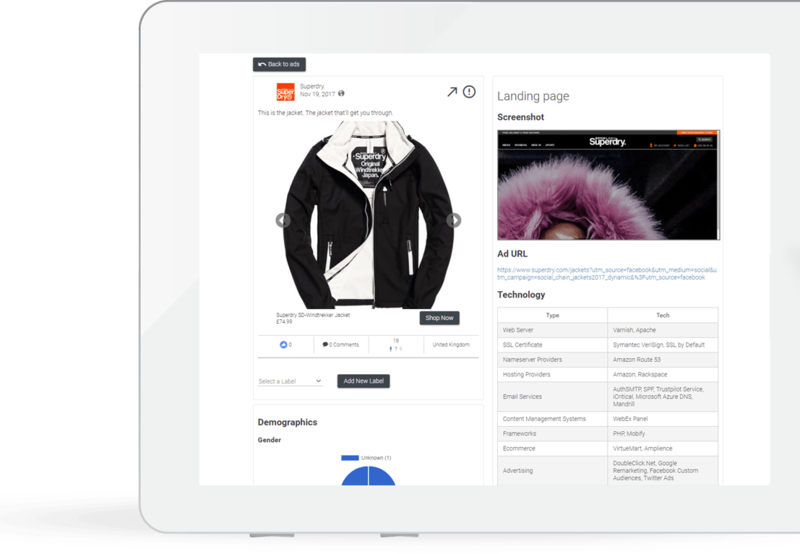 We pushed ourselves to create the most comprehensively featured Advertising Intelligence Tool on the market. As well as its industry leading collection of data, AdSpy has unique features that others haven’t considered or can’t implement. The features you expect - enhanced. Search by the text in the ad, the advertiser’s name, the number of likes it has, the type of media it uses, etc. Sort the results with clever filters: when was the ad last seen? How do users react? Which ad is the longest running? AdSpy is as powerful as you want to make it. With our comment search, social media users are labelling ads for you. Search through ad comments with the keywords you think are important: monitor competitors’ brands, your own brands, or see what’s had positive or negative feedback. Using its unrivalled network of contributors, AdSpy can accurately assess who an ad is trying to target based on their location, gender, and age range. Your competitors may be dominating in regions and across markets you haven’t yet considered: AdSpy can show you them all. As affiliates ourselves, we've built the tool that we want to use. You can find ads by affiliate network, or search for specific affiliates and offers. Have you just been given a great offer by your network? Search via the Offer ID and see how others are promoting it. AdSpy also bypasses cloakers to ensure you have flawless information straight from the landing pages. AdSpy simply has the largest pool of data available to you. If a hot product is kicking off and dropshippers need to know, you can be sure that AdSpy knows already. It’s no small task to search through millions of records in seconds. Fast servers, efficient programming, clear interfaces, and well presented data ensures that nothing can slow your research. Check out our demo of what features we offer and how you can get the most out of the software. We offer more search features and more data than all our rivals... Not only that, but we're cheaper too! We offer virtually unlimited usage for just $149 per month! Be quick though, this is an introductory offer and will not be the same for long! Why waste thousands of dollars testing ads blindly? Find proven ads, innovate, profit.